Write Nicole Browne took time with Seabastion Toast to find out how she discovered Plein Air Painting and how it consistently inspires and invigorates her art practice. How did Plein Air painting find you? And tell us a little about it? I have always led an active outdoorsy life and was raised climbing mountains, skiing through blizzards and trekking the high plains and have continued that legacy through my love of trail running and surfing. When interpreting the landscape I thus want to capture more of my experience of and a relationship to the land rather than a direct rendering of topographical features. I found working from photographs just couldn't cut it as the camera has an equalising (dulling down minimising) affect, whereas my actual experience is much more heightened. I also enjoy the physical constraints imposed by the act of plein air painting. Time is often limited, the light is continually shifting, you are exposed to the elements, bugs like to taste you, the colors are richer and more immediate and you are recording a moment in time that can never be repeated. In this way I use plein air painting (and indeed all studies from life) as an exercise to push me out of my comfort zone and engage directly with the subject in a less static manner. 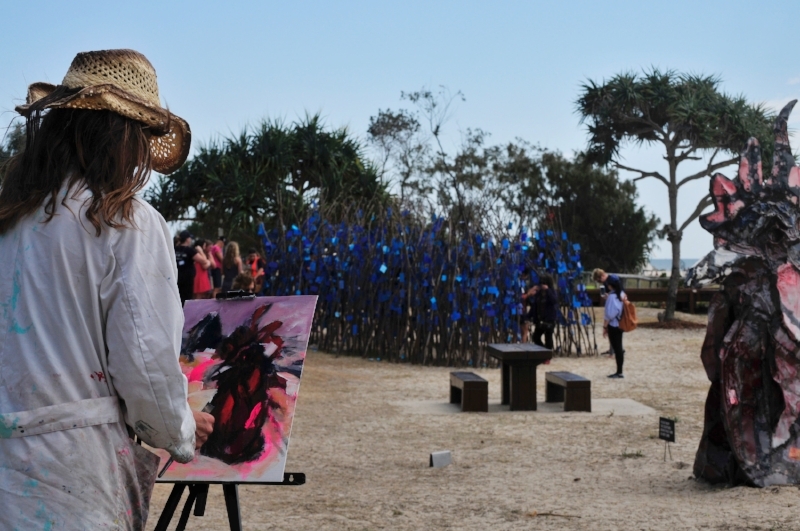 What is your connection to Currumbin, the place of SWELL Sculpture Festival? My connection to Currumbin really is strong. For me it was moving here to the Gold Coast, specifically Currumbin that gave me the time and space to allow my art career to really take off. The community here is so incredibly warm and supportive I feel extremely lucky to be a part of it. 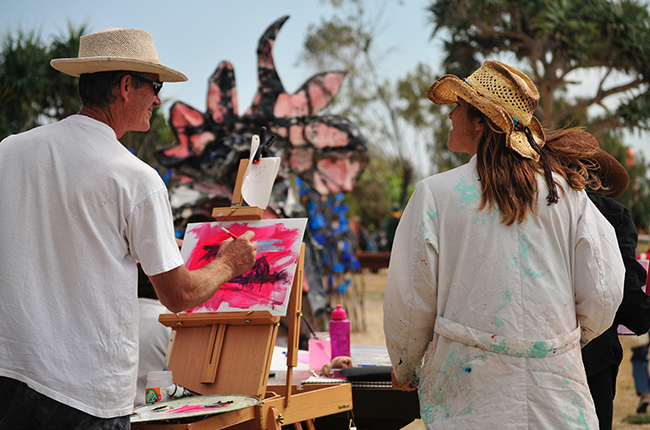 I have visited the Swell Sculpture festival almost every year I have lived here and, as the festival was one of our first dates, my now husband and I consider it to be somewhat of an anniversary of our partnership. You are giving Plein Air painting workshops again at this year’s festival, tell us what people may expect attending your workshops, and further, this being your second year giving these workshops at SWELL what did you enjoy most about it? I have designed this workshop so participants can learn techniques that will strengthen their skills regardless of their preferred style or subject matter. We are going to work essential design strategies and compositional elements so that participants will gain confidence to get out there and enjoy the experience of plein air painting no matter where they are or what their skill level. Using both the sculptures that make up the festival and the landscape in which they are situated for inspiration we are going to explore the key concepts involved in creating a two dimensional painting from a multidimensional experience. Being involved last year really put me on a week-long high as a result of connecting with others through my passion for art. And working with others on their art really exercises my brain and opens up possibilities I could never have imagined on my own. Tell us about your connection to art and community? Being an artist is not a job you log off from. Art is always with me in every waking and sleeping moment. Much of my time is spent in my studio alone or with my husband who is also an artist, and while I revel in this self-imposed isolation it is equally inspiring to emerge from my art cave to be able to share parts of my world and be inspired by others who share similar passions. Art cannot exist without community, my paintings are always a dialogue and without an audience to complete and enrich that dialogue the work has no purpose. Swell Sculpture festival celebrates the role art plays in our community and brings us all together in ways that entertain and challenge our perspectives in a very wholesome manner. Leave the four walls of your studio and experience Plein Air Painting with Seabastion Toast this Sunday. Guided by Seabastion, the workshop will comprise of three parts: an introductory session outlining the elements of design and other useful techniques when approaching the subject, plein air (outdoor) painting session, and a feedback/resolution session. BOOK ONLINE!